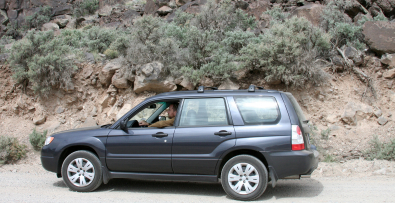 Just a month ago I completed the sale of my 2008 Subaru Forester. After making payments on it for 2+ years, I decided that I wanted something different, something that I had owned before. So I bought myself a 2007 Mini Cooper S that is still under the factory warranty with just over 40,000 miles on it. I couldn’t be happier with my decision! But I digress – I want to talk about selling my Subaru and the steps I went through in order to discover what it was worth, what I could possibly get for it, and then finally deciding on a buyer. The first thing I did was find out how much I still owed on the car – this was my “I must at least get this for the car so I can pay it off entirely and then buy something else” price. Luckily, I made a heck of a deal on the car when I bought it, paying just $19,000 out the door including taxes/fees – this for a car that had a sticker price of almost $24,000 plus tax. So right away, I knew that my “what I owe to residual value ratio” was pretty good. Add in the fact that I always paid more than the minimum payment on the loan each month, and my final dollar amount that I owed as of a month ago was $13,109. This was how much I had to get for the car in a sale to break even and walk away clean. It was my bottom price point. Sold. I get to walk away with a few extra hundred bucks back, I get a fair price for my car, and I don’t have to haggle or deal with individual people trying to get the best price or arrange financing. As an added bonus, my car was still registered in New Mexico, and thus I didn’t have to pay to have it transferred here for a private buyer. I handed CarMax the keys and walked away. Sure, they will sell it on their lot for a lot more than that, but I just wanted to sell the car for a fair price and pay off the balance. Goal achieved! As you can see, finding out the value of your car and then selling it can take you on many different paths. The key is to explore several different ways of finding out (and running) the numbers to make any deal work for you. If Kelly Blue Book and Edmunds don’t work for you, you can also check out NADA or Cars.com to get even more information. this was defintiely the easy way to sell your car, but dont you think an extra grand or 1500 would have come in handy? im sure you could have waited, placed some ads and gotten more money for it. were you in a rush to sell the car and get your mini? If you have the patience to sell your used car on your own, you will for the most part always get more money than if you trade it in. Its definitely the way to go. This is a great method you used to get the most for your money. I was not aware of the Kelly Blue Book website. I will use it for future reference. Thanks for another avenue to check out with the Carmax. We are in the process of buying a new car (shopping just this morning), while they would love to get their hands on my ‘pristine’ Mercury Mountaineer (which is a true little-old lady only to the grocery driven car as my dear husband likes to call my poor suv) i will in no way trade it in and take a beating while they make a mint. We will attempt to sell outright but with the economy the way it is and the suv’s sitting around because everyone is going for good gas mileage cars now we may be sitting on it. I will check into the Carmax as another alternative. Thanks! If you’re looking to buy a new car Kelly Blue Book, Edmonds and Truecar are the best sites to use.